Ho, ho, ho! It’s my favorite time of year again where the icicle lights hang from fascia trim, the trees and bushes are glittering in brightness, and yes, the inflatables wallow in the wind on the roofs! Rudolph and frosty take their prominent places out in the front yard and Jack Frost is [kinda] nipping at your nose. Yes, it’s the holiday season and that means Christmas holiday lights are here. For some communities the holiday season beckons a neighborhood group effort, an opportunity to come together and create a winter wonderland of Christmas holiday lights for all to see. And, ONCE AGAIN, I’ve created the custom GoogleMap featuring all of San Diego’s best holiday light neighborhoods and events. Since we started it, it’s been downloaded/viewed over 32,000 times! It started just for my family’s own use, and has since spread among friends & family of friends of friends. This year, I have 60 pindrops on the map. Each pindrop will give address, photos, details, and more…AND will even open up the directions within your map app on your phone. So, don’t leave home without this! Please share with your friends and family. You can simply click here for an immediate share to your FB page: SHARE. 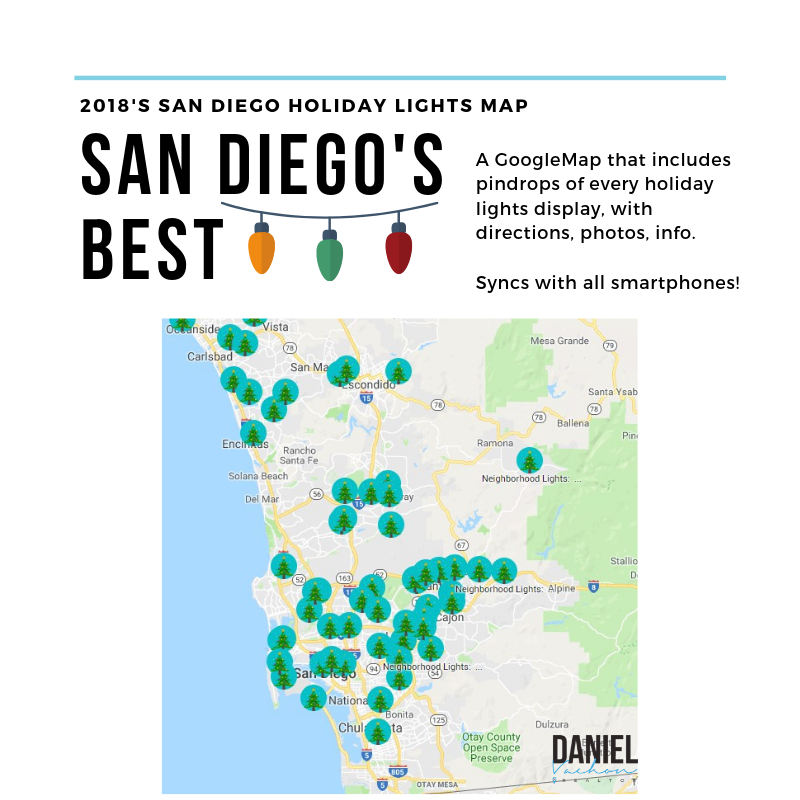 Click the image below to be directed to the 2018 San Diego’s Best Holiday Lights Map. Happy Holidays from the Vachon Family.